Today Capital Metro welcomes the community to beautiful Plaza Saltillo Station to tour the Capital MetroRail train, pick up schedules and learn to use the new electronic ticket vending machines. Plaza Saltillo is unique and beautiful. 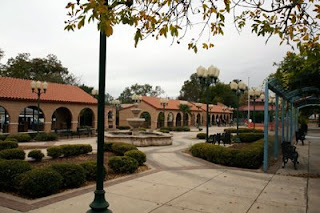 Inspired by the plazas of Mexican cities, and named for Austin’s sister city of Saltillo, Mexico, Plaza Saltillo was built in 1998 and boasts a beautiful courtyard and fountain, a space for outdoor vendors, and a bandstand. The city of Saltillo donated the ornate, traditional benches that are found throughout. Plaza Saltillo was a collaborative project between the city of Austin, Capital Metro, and an east Austin cultural group called Ole Mexico. Since 1998 it’s been the site of many celebrations, and today we can add one more to the list. The presence of the bright red MetroRail steel framing for the platform–an identifying hallmark at every station–as well as the electronic ticket vending machines (not to mention the uber-sleek train itself), lends a modern edge to a plaza that is steeped in tradition and full of community memories. Soon it will serve as a gateway to downtown business, and as the first welcome to passengers who exit the train in east Austin. Today you can be a part of it all, and be one of the first to see how fitting Plaza Saltillo is as host for Capital MetroRail. We’ll be there, as will the train, from 10 a.m. to 2 p.m.
TODAY, 10 a.m. – 2 p.m. Thanks for coming out, Parker, snakes and all!